Margaret and I enjoyed a long weekend in Chicago a couple weeks ago. We stayed in a lovely hotel in The Loop and walked all over to do a little Christmas shopping and enjoy the sights. 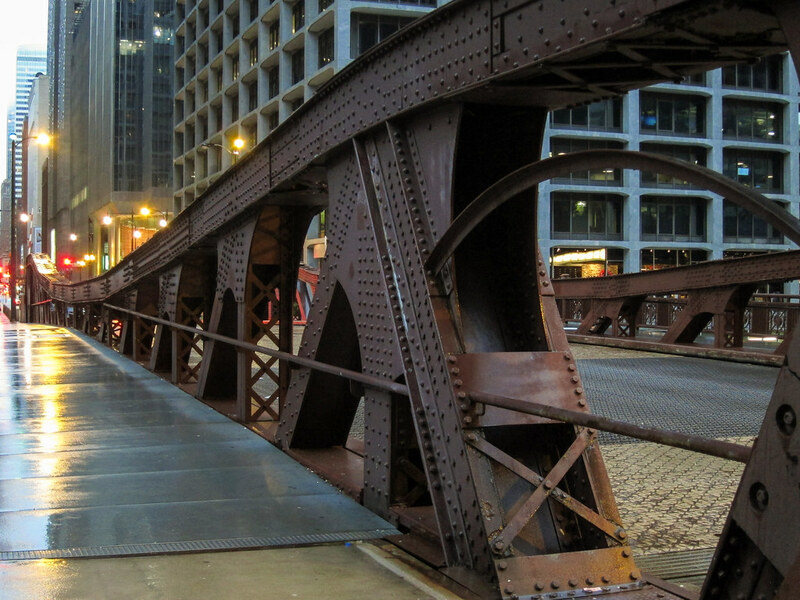 If you’ve never been, The Loop is bordered on the north and west by the Chicago River. 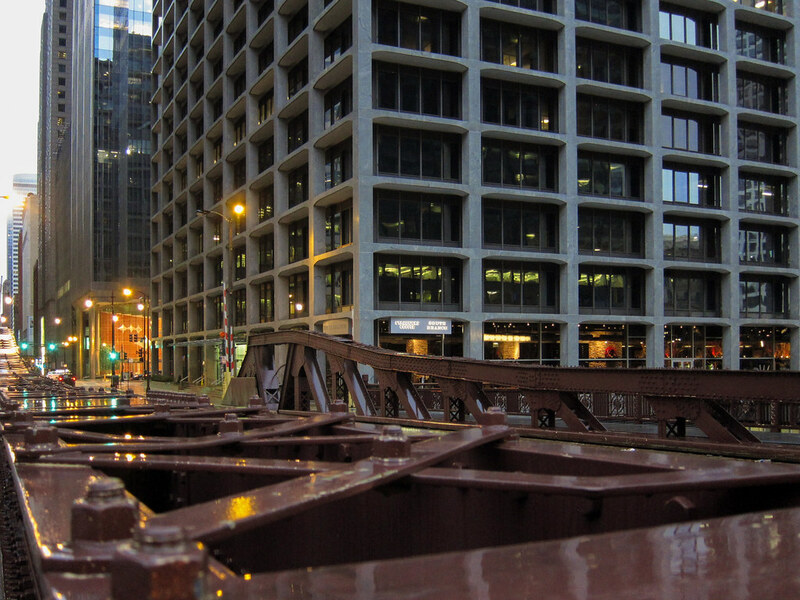 Eighteen bridges span this river here, allowing traffic to flow into the rest of Chicago along every major avenue. Here’s just one of them, on Monroe Street a couple blocks from Union Station. 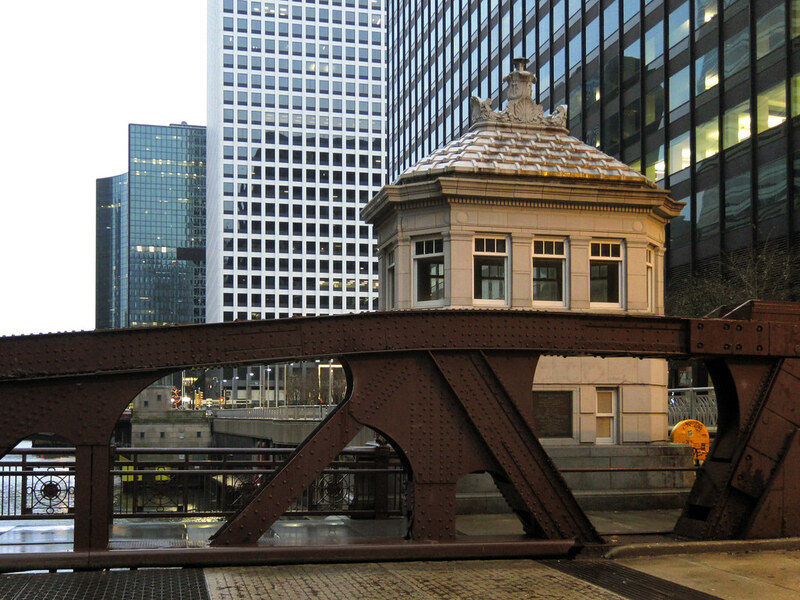 Many of these bridges are in the Beaux Arts design and this one is no exception. The bridges in place here now were built mostly during the first half of the 20th century; this one was completed in 1919. Each of these 18 bridges raises or swings out of the way to let ships pass. The Monroe Street Bridge in particular is a drawbridge, more precisely a bascule bridge. The building on the right is where the operator lifts the bridge. If found out in the country, each of these bridges would seem massive. But surrounded by Chicago’s high rise buildings they seem strangely small, yet impossibly sturdy. 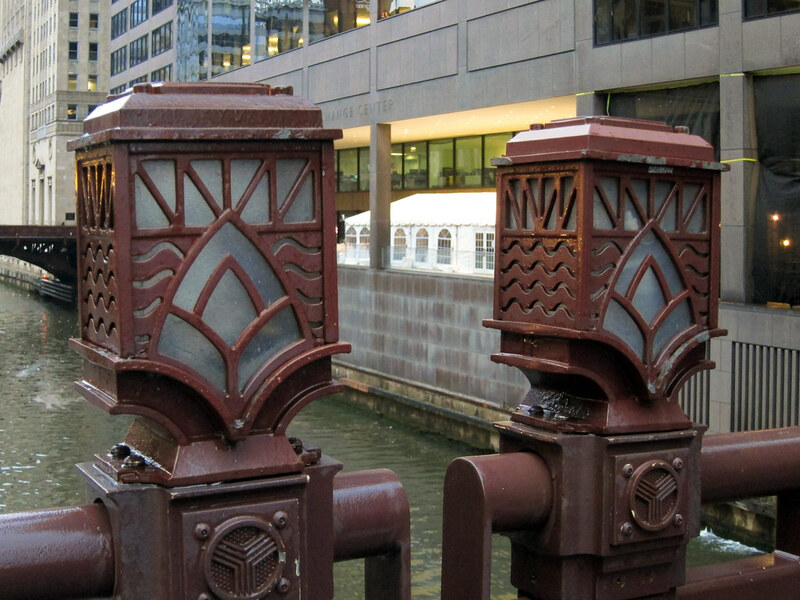 The Monroe Street Bridge is dotted with these lamps, lighting the pedestrian walkways at night and, I’m sure, providing a lovely view from the neighboring bridges. As you cross any of the Chicago River bridges in the Loop, you can see many of the others — and take in a great view of the city. I walked over the Madison Street bridge (one block north of Monroe) for many years. I worked in the building just across the river, opposite the Lyric Opera on Madison and took the train to Ogilvie Center. The bridges are amazing and can be slick when the steel gets cold. Here is a bit of trivia for you. 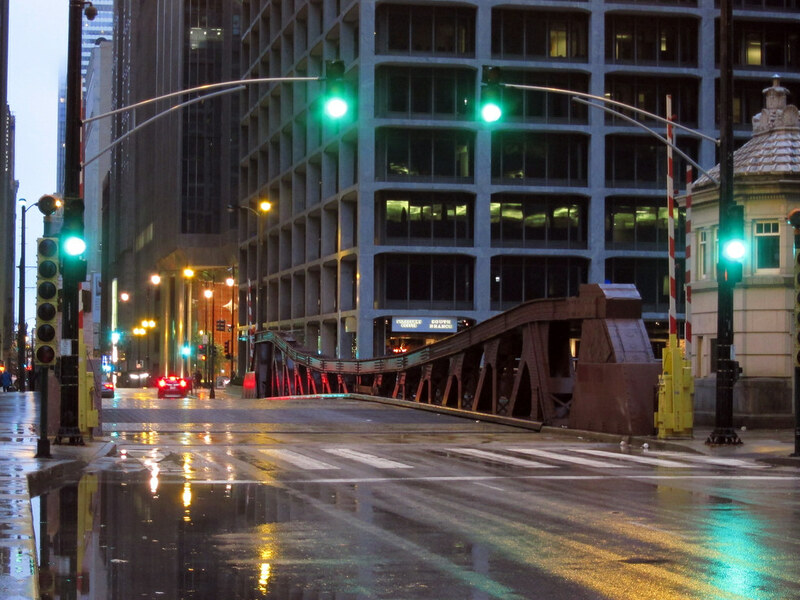 The “Y” symbol you see on the bridge lanterns is one you will find scattered throughout Chicago. 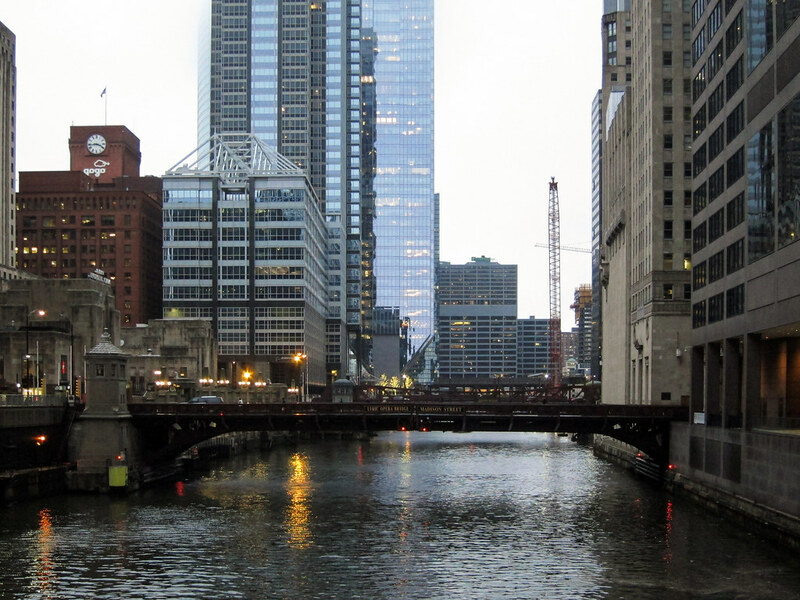 It is a graphic representation of the Chicago River itself, at the confluence of the North and South and Main Branches of the River also known as Wolf Point. Thanks for sharing. That is so cool about the Y symbol! I love learning details like these. Thanks!